In There And Back Again, we delve deep into the most important texts in modern fantasy, and stories which have enchanted generations. From The Hobbit to The Lord of the Rings and The Silmarillion, we study every detail of Professor Tolkien’s epic creation. You can find the Point North broadcast schedule here, or follow Point North on Crowdcast to be notified of the live sessions! Subscribe to There And Back Again on iTunes, Google Play Music, YouTube or via RSS. In this week’s session, we return to Rivendell and say some fond farewells in chapters six and seven of Book Six of The Lord of the Rings. In this week’s session, we welcome Frodo and Sam back to the land of the living, and discuss the greatest romance in Middle-earth in chapters four and five of Book Six of The Lord of the Rings. In this week’s session, we approach the final fate of the ring with a discussion of heroism, strength and fortitude in the shadow of Mount Doom in chapter three of book six of The Lord of the Rings. In this week’s session, we continue book six of The Lord of the Rings with more discussion of hope and despair, greatness and grace, and strong masculine relationships. 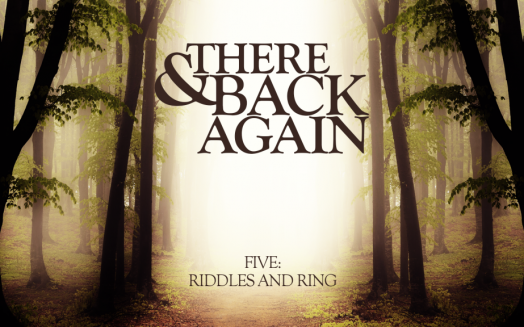 In this week’s session, we begin book six of The Lord of the Rings with the return to Samwise Gamgee, the influence of the ring, and spontaneous poetry. In this week’s session, we conclude book five of The Lord of the Rings with the march to Morannon, Aragorn’s mercy, and Pippin’s last stand. In this week’s session, we approach the end of book five of The Lord of the Rings with healing, debate and discussion, and the importance of gulls. In this week’s session, we discuss hope and despair at Denethor’s pyre, and then bring athelas to the Houses of Healing. In this week’s session, we conclude the Battle of the Pelennor Fields, and discuss eucatastrophe, magical winds, and try not to weep openly. In this week’s session, we ride with the Rohirrim to Minas Tirith and begin the Battle of the Pelennor Fields. In this week’s session, we discuss hope and despair, the siege of Gondor, and the clash of Gandalf and the Witch-King of Angmar. In this week’s session, we discuss the new The Fall Of Gondolin book, the muster of the Rohirrim, and the beginning of the Siege of Gondor. In this unexpectedly abbreviated session, we discuss the role of women in Tolkien’s world, and the conversation between Aragorn and Éowyn! In this session, we make it to the second chapter of The Return Of The King with discussions of oaths and oathbreaking! In this session, we begin The Return Of The King with discussions of the White Tree of Gondor, high style and the nobility of hobbits. In this session, we discuss the future, Orc culture and the extensive history of the One Ring as we conclude The Two Towers. In this session, we study separation and despair as we reach the end of The Two Towers in Chapter Ten of Book Four, The Choices Of Master Samwise. In this session, we talk about the power of stories with Sam, then face the evil of Shelob with the phial of Galadriel in chapters eight and nine of book four of The Lord of the Rings. In this session, we catch up with Frodo and Sam as they leave Ithilien for the dangers of Mordor in chapters six and seven of book four of The Lord of the Rings. This week, we celebrate our fiftieth session by running long and adding an extra session as we continue our exploration of book four of The Lord of the Rings! In this session, we talk about the excellence of Faramir and Sam as we discuss chapter five of book four of The Lord of the Rings! In this session, we find solace in Ithilien and meet Faramir of Gondor as we discuss chapters three and four of book four of The Lord of the Rings! In this session, we cross the Dead Marshes and discuss the second chapter of book four of The Lord of the Rings! In this session, we discuss the first chapter of book four of The Lord of the Rings! In this session, we reach the end of book three of The Lord of the Rings and discuss Pippin and the palantír. In this session, we discuss chapters nine and ten of book three of The Lord of the Rings. In this session, we discuss chapter eight of book three of The Lord of the Rings, The Road to Isengard. In this session, we are besieged with the Rohirrim in book three, chapter seven of The Lord of the Rings! In this session, we discuss the healing of the king of Rohan in book three, chapter five of The Lord Of The Rings! In this session, we discuss the upcoming Amazon TV adaptation of Tolkien’s world, then conclude our discussion of book three, chapter five of The Lord Of The Rings! In this session, we share the tale of the entwives and are reunited with Gandalf in book three, chapters four and five of The Lord Of The Rings! In this session, we meet Treebeard and delve into the history of the ents in book three, chapter four of The Lord Of The Rings! In this session, we return to the hobbits and meet the Uruk-hai in book three, chapter three of The Lord Of The Rings! In this session, we send Boromir off into the Anduin and meet the Riders of Rohan in the first two chapters of book three of The Lord Of The Rings! In this session, we delve deep into the final temptation of Boromir, and discuss Frodo’s choice at the end of the Fellowship of the Ring. In this session, we conclude The Fellowship of the Ring and witness the end of the Fellowship in chapters 9 & 10 of Book 2 of The Lord Of The Rings. In this session, we discuss The Fellowship Of The Ring, Book 2, Chapters 7 & 8: The Mirror of Galadriel & Farewell to Lórien! In this session, we escape the shadow of Moria and cross the Nimrodel into Lothlórien in book two, chapter six of The Lord of the Rings! In this session, we face Durin’s Bane and fly from Moria in book two, chapter five of The Lord of the Rings! In this session, we confront Caradhras and venture into Moria in chapters three and four of book two of The Lord of the Rings! In this session, we make a valiant effort to leave Rivendell and make it to Caradhras in Book 2, Chapter 3 of The Lord of the Rings! In this session, we complete our discussion of the Council of Elrond in Book 2, Chapter 2 of The Lord of the Rings! In this session, we try valiantly to make it through the Council of Elrond, and fall just a little short of our goal. In this session, we catch our breath in Rivendell and discuss a remarkable poetic achievement in book two, chapter one of The Lord of the Rings! In this session, we race from Weathertop to the Ford of Bruinen, meeting Glorfindel and facing down black riders in chapter twelve of The Lord of the Rings! In this session, we depart from Bree, confront the black riders on Weathertop, and hear the tale of Beren and Luthien! In this session, we arrive in Bree, spend some time at the Prancing Pony, and meet the man they call Strider! In this session, we discuss the importance of blue jackets and yellow boots, and journey with the hobbits through the Barrow-Downs! In this bonus episode, I delve into the listener mailbag to answer questions on Gandalf, the origin of dwarves and orcs, and the protection of the Shire. This week, we cover chapter five and six of The Fellowship of the Ring, and discuss Buckland, Sam’s heroism, and the nature of the Old Forest. This week, we cover chapter four of The Fellowship of the Ring, and discuss Sam’s first encounter with elves, short cuts and beer, and the goodness of Farmer Maggot. This week, we cover chapter three of The Fellowship of the Ring, and discuss hobbit-style urgency, leaving Bag End, encounters with Black Riders, and elves, sir! Elves! This week, we cover the second half of the second chapter of The Fellowship of the Ring, and discuss Frodo’s choice, the location of the Three Rings, and Sam Gamgee! This week, we cover the first half of the second chapter of The Fellowship of the Ring, and discuss what Gandalf knew and when, the history of the ring, and the darkening world. This week, we begin The Fellowship Of The Ring, and discuss hobbit culture, the influence of the ring, and how much Gandalf really knows. This week, we open The Lord of the Rings and discuss the prefatory material, including Tolkien’s discussion of allegory and applicability. This we look back on The Hobbit and catch our breath before moving into The Lord Of The Rings next week! This week, we conclude The Hobbit as Bilbo bids farewell to Thorin and the dwarves, and returns home from the Mountain to the Hill. The clouds gather as we approach the end of The Hobbit, and the Battle of Five Armies. This week, the narrative takes a turn as Bilbo burgles the Arkenstone, and Smaug meets his watery doom. This week, we battle illness and technical inconvenience as Bilbo arrives at the Lonely Mountain, and finally meets Smaug. This week, Bilbo rescues the dwarves from the halls of the Wood Elf King, and the company arrives in Laketown in the ninth and tenth chapters of The Hobbit! This week, Bilbo ventures into Mirkwood and becomes a hero in the eighth chapter of The Hobbit! This week, Bilbo meets Beorn in the seventh chapter of The Hobbit! This week, Bilbo emerges from the Misty Mountain and moves into the Wild in the sixth chapter of The Hobbit! This week, Bilbo meets Gollum and finds a curious magical ring in the fifth chapter of The Hobbit! This week, Bilbo reaches Rivendell and delves beneath the Misty Mountains in the third and fourth chapters of The Hobbit! This week, Bilbo begins his adventure and runs right into trolls in the second chapter of The Hobbit! This week, we meet out hero, our wizard, and many, many dwarves. Welcome to the first chapter of The Hobbit! This week, we begin our journey through the works of JRR Tolkien by looking at his manifesto for fantasy literature, On Fairy Stories! In 2017, we’re going on a grand adventure through the pages of The Hobbit and The Lord Of The Rings!